Installing driveway pavers can be a daunting task if you’re clueless on what to do. Deciding what materials to use from a plethora of choices can be a bit paralyzing and confusing. If you’re a DIY person aiming to refurbish a worn, cracked driveway or someone who simply wants to be informed, the starting point always involves understanding the basics. Driveway pavers essentially cover the surface of a muddy path. The objective of installing driveway pavers is to enhance the overall aesthetic quality of the path. Another is to ensure the stability and sturdiness of a path in order to efficiently direct vehicle traffic towards the proper parking area. The design of driveways entails lots of considerations including the slope of the driveway, the area of the driveway and the surrounding environment. Before installing driveway pavers, it is important to know the inclination of the driveway. The primary purpose of grading or sloping is to direct rainwater towards the lawn area then into a drainage pit along the street. You don’t want puddles forming along the path as it makes the road slippery and accident prone. Pools of water can also be a nuisance when formed on carefully designed landscapes. Take a look around to check if the area is too flat. Once this is confirmed then you need to have the path graded. This will ensure the functionality and safety of your driveway. 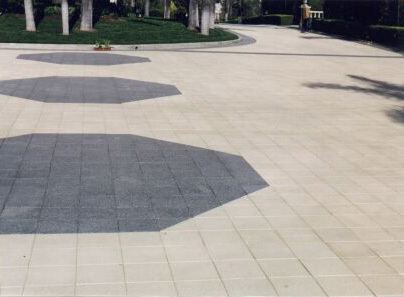 Driveways are primary components of a building’s façade particularly in residential buildings. Making a good impression can begin with having a well-designed path that complements the overall theme of the property. To gather some ideas, recall your favourite vacation spots or survey neighbourhood driveways for inspiration. Conceptualizing a driveway design can be your opportunity to recreate your favourite places. Next, consider the patterns or structure of walkways, patios and porches prior to installing driveway pavers. This simple activity can give you a perspective on which materials create harmony in certain environments as well as set the overall mood of the concept. Once the design concept and driveway dimensions have been finalized, the next step is to determine the right materials. 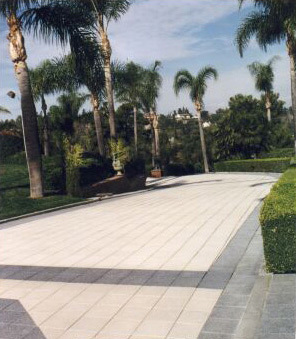 Driveway pavers are generally classified as stone pavers, concrete pavers and brick pavers. These pavers are available in a wide variety of colors and shapes to suit different tastes. Installing driveway pavers can be transformed from an intimidating task into an exciting activity. Anticipation builds as the pavers are laid one by one, slowly forming the design. Knowledge of the basic steps in installing driveway pavers serve as the basis for building functional and aesthetically pleasing driveways. The main purpose of grading or sloping the driveway is to direct rain water away from the house or building structure toward the yard area or into a drainage pit. Have a look at the driveway site to see if it is too flat. If so, the driveway will need to be graded to prevent rain water ponding or pooling on the landscaped lawn area. Dig out some soil and move it to another area of the yard or garden; place a simple catch basin and drain at the lowest spot in the driveway. This drain connects to an underground pipe that will empty into the street when it rains. Therefore, when planning a new or upgraded driveway, also consider how walkways, porches and patios in these materials can unify the property and give your home even more curb appeal. This is also a chance to create outdoor spaces that will help you and your guests enjoy the yard and garden. The design opportunities are limitless when it comes to your driveway. You can start off by choosing amongst so many different materials, such as; natural stone pavers, rubber pavers, brick pavers, poured concrete and precast concrete pavers, to name a few. 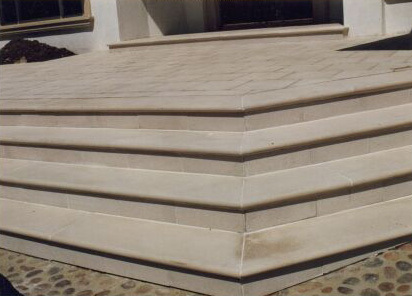 There are many varieties of natural stone pavers, such as; limestone, bluestone, sandstone, granite, slate and flagstone. When considering a concrete driveway you can choose from stenciled concrete, stamped concrete and color stained concrete. Gone are the days of the plain gray concrete driveways. Once you have chosen your material, you can then start to decide on the color, shape, design, patterns and sizes. Again the possibilities are endless; you can choose any color you could dream of to match the rest of your property. Whether you’re using stone pavers or concrete, you can achieve so many patterns, such as; herringbone, running bond, basket-weave and cobble design. There are many decisions to be made, but what makes it so much easier is the abundance of choices available when installing driveway pavers, to help you create an appealing driveway. When deciding on the width of the driveway, be sure to allow a minimum of twelve feet wide at the vehicle parking areas so that it will be a sufficient space to move around the vehicles exterior and avoid stepping on any lawn nearby. As for the length of the driveway, it should be at least 18 feet in length per vehicle.